The transmissible spongiform encephalopathies (TSEs) are a group of neurodegenerative diseases affecting both human and animals. The neuroanatomical changes which occur in the central nervous system (CNS) of TSE infected animals include vacuolation, gliosis, neuronal loss and the deposition of a disease specific protein, PrPSc. Experimental murine models of scrapie, a TSE of sheep, have revealed that pathology may be confined to specific brain areas with targeting of particular neuronal subsets depending on route of injection and scrapie isolate. To assess the biochemical changes which are taking place in these targeted areas it was necessary to develop a reliable sampling procedure (microdissection) which could be used for a variety of tests such as western blotting and magnetic resonance spectroscopy. The method described is for the microdissection of murine brains. To assess the usefulness of this dissection technique for producing similar sample types for analysis by various down-stream biochemical techniques, the areas dissected were analysed for PrPSc by western blotting and compared to immunocytochemical (ICC) techniques. Results show that the method generates samples yielding a consistent protein content which can be analysed for PrPSc. The areas in which PrPSc is found by western blotting compares well with localisation visualised by immunocytochemistry. The microdisssection method described can be used to generate samples suitable for a range of biochemical techniques. Using these samples a range of assays can be carried out which will help to elucidate the molecular and cellular mechanisms underlying TSE pathogenesis. The method would also be useful for any study requiring the investigation of discrete areas within the murine brain. Transmissible spongiform encephalopathies are a group of neurodegenerative diseases which include scrapie, bovine spongiform encephalopathy (BSE), and Creutzfeldt-Jakob disease (CJD). Murine models have increased our understanding of the pathogenesis and biochemistry of scrapie and indeed have been an invaluable tool in the characterisation of emerging TSEs such as BSE and vCJD (variant form of CJD linked to BSE exposure) [1, 2]. Scrapie in murine models has a long asymptomatic phase, the length of which is characteristic of the model, followed by onset of progressive clinical signs and finally death . Neuropathology of a TSE infected animal reveals vacuolation of the neuropil, gliosis, and neuronal loss [4, 5]. Another major pathological feature of scrapie is deposition of an abnormal form of the protein PrP  which is also found in the brains of other TSE disease affected animals [7, 8]. PrP is a host-encoded glycoprotein with a primary structure of approximately 210 amino acids [9, 10]. There are two N-linked glycosylation sites and a C-terminal glycophosphoinositol (GPI) anchor [11, 12]. The unglycosylated protein has a molecular mass of about 25 kDa increasing to 33–35 kDa when fully glycosylated. The normal form of the protein is both detergent soluble and protease sensitive  in contrast to the abnormal form which is characterised by its relative protease resistance and insolubility in detergents. When treated with proteinase K the abnormal protein is partially digested and the resulting protease resistant form, migrates on a 1-dimensional electrophoresis gel (SDS-PAGE) to a distinct three band pattern with molecular mass between 18–30 kDa. The relative amounts of these bands has been examined as a possible diagnostic tool [14–16]. Glycosylation is also host controlled  and the banding pattern may also be specific to particular brain areas and neuronal subsets . The murine scrapie models 87V and ME7 used in this experiment define the variation in pathology found in TSE pathogenesis. The 87V model displays PrPSc in plaques and restricted labeling . By contrast in the ME7 model, PrPSc is found throughout the brain [20, 21]. The variation in temporal and spatial distribution of PrPSc and the mechanisms leading to neurodegenerative changes seen at terminal stages have still to be elucidated. To understand the neurodegenerative events leading to neuronal loss, we have recognised the need to isolate specific brain areas and examine each biochemically for mechanisms such as apoptosis and PrPSc deposition. Whilst other groups have examined biopsies from specific brain areas in humans  and by dissection in hamsters , we require a method for murine brains which is reproducible and can be used in a range of biochemical tests. 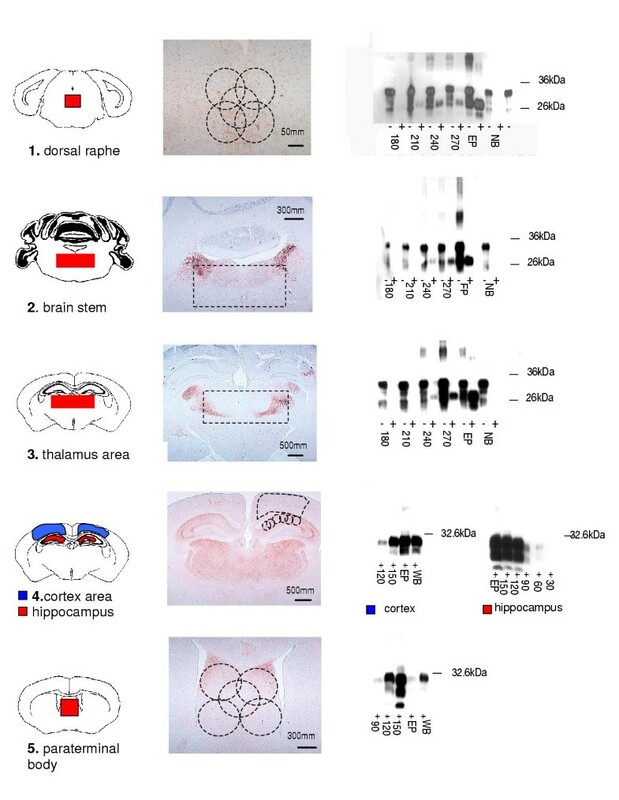 As only a small amount of tissue is obtained from a murine brain, biochemical methods, in particular a western blotting technique for PrPSc had to be adapted to maximise sensitivity. We report our method of collection of samples and show immunoblots of PrPSc deposition within microdissected areas, as an illustration of use within the TSE field. The method however could be used to collect samples from murine models in other areas of research. All animals used in the experiment were housed and procedures carried out within a UK Home Office licensed unit which complies with the Animals (Scientific Procedures) Act 1986. Two inbred mouse strains VM/Dk Prn b (VM) and VM/Dk Prn a (SV) were inoculated intracerebrally with 20μl of a 1% (w/v) brain suspension of either 87V (VM) or ME7 (SV) strains of scrapie. Similar control groups were inoculated with a normal brain homogenate. The animals were culled by cervical dislocation at suitable intervals throughout disease, (ME7 model: every 30 days post injection (dpi) until the terminal stage of disease at about 160 dpi. 87V model: every 50 dpi until about 300 dpi). The brain was removed and carefully placed (to avoid damage during freezing) in a plastic universal tube, flash frozen in liquid nitrogen, and stored at -70°C. Brain samples for histology were fixed in 10% formol saline (see section 2.4). Three brains were collected at each time point and microdissected for Western blotting as described in the following sections. Weights from samples obtained by microdissection are shown in Table 1. Table showing the mean weights of dissected brain areas. 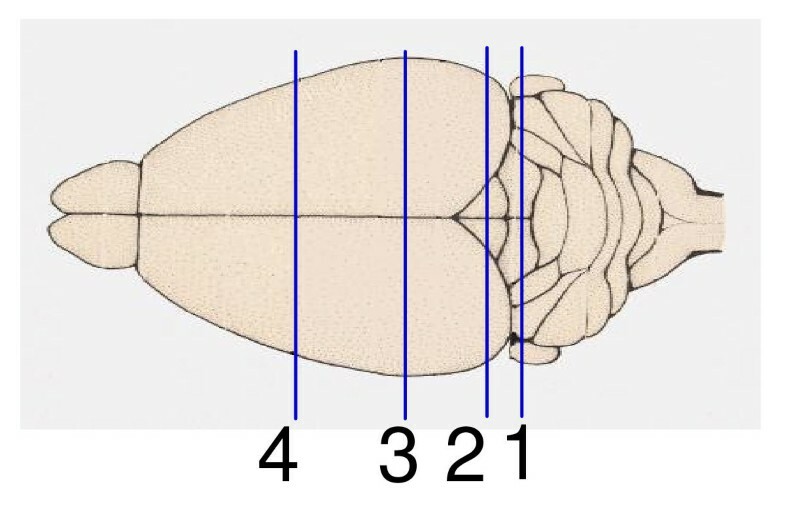 Microcentrifuge tubes numbered with animal number and brain area were weighed on a fine balance (Stanton). A cold plate (Model E/66.3 Raymond Lamb Laboratory Supplies) was set to -10°C, and covered with aluminium foil for each sample. The brain was allowed to partially thaw before placing on the cold plate area. The brain was held gently with curved forceps and using a scalpel (Swann Norton No.11) four slices were coronally cut as in Fig. 1. Each slice was further dissected by cutting out areas of interest as shown in Fig. 2. Where the area of interest was too small for accurate dissection in this manner, a punch method was employed. Maps of dissected areas. Blue depicts areas cut with scalpel. Red depicts punched areas. Using the cannula only of a biopsy needle (Seldinger needle, 18 g, 7 cms, Scottish Medical) a "core" of selected brain area was sampled by punching through the brain slice. Four to six punches were sampled and expelled by use of a syringe attached to the end of the cannula into the weighed microcentrifuge tube (Fig. 3). All samples after microdissection were immersed in liquid nitrogen immediately. The microcentrifuge tube was then re-weighed, the weight noted and the sample stored at -70°C. Every effort is made in the method to avoid tissue degradation. The whole brain was flash frozen and microdissection carried out on a cold plate. After microdissection the tubes containing microdissected areas are again flash frozen to avoid any loss of protein. As continual freezing and thawing would degrade the protein the samples had to be weighed between coming out of the liquid nitrogen and storing in the freezer without further thawing. In order to allow for discrepancies in weight due to freezing effects, two empty microtubes were weighed before and re-weighed after immersion in liquid nitrogen. The difference between the weights (average 0.0020 g) is used as a correction factor and subtracted from the sample tubes. In this way a wet weight equivalent is obtained as shown in Table 1. Each sample was homogenized in 10% wt/vol. lysis buffer (100 mM Tris buffered saline (TBS) pH 7.5, 0.5% deoxycholic acid, 0.5% NP40) using a battery operated homogeniser (Sigma Aldrich) with disposable pellet mixer (Anachem) attached. The homogenate was then halved, proteinase K (final concentration 20 μg/ml) added to one aliquot (+PK) and digested at 37°C in a water bath for 40 minutes. To stop further degradation due to protease digestion a solution of 100 mM phenylmethanesulfonyl fluoride (PMSF), 100 mM N-ethylmaleimide (NEM) in propan-2-ol to a final concentration of 10 mM was added. The protease inhibitors were also added to the untreated (-PK) aliquot. Protein precipitation was then carried out using 4 × vol. of an ice-cold mixture of 2% acetic acid in methanol. After freezing overnight at -20°C the samples were centrifuged for 10 minutes at 16,000 g, the supernatant removed and the pellet dried for one hour in a centrifugal vacuum concentrator (Thermo Savant Speed-Vac). Total protein estimation was carried out following the microwell plate protocol of a BCA Protein Assay Kit available from Perbio Science(Product 23225 & 23227). A 5 μl aliquot of homogenate was pipetted to a microtitre plate well containing 20 μl of distilled water i.e.1:5 dilution of original homogenate. A range of standards were prepared as per the protocol, using similarly diluted lysis buffer as diluent. The samples and standards were read and analysed on a 'Molecular Devices' v-max microplate reader. The protein content of seven brains, taken at different time points throughout disease progression, are shown in Table 2. The pellet was solubilised in 1 × sample buffer (dilution of 5 × sample buffer (Tris-HCl, 60 mM pH 6.8, 25% glycerol, 2% sodium dodecyl sulfate (SDS), 1% 2-mercaptoethanol, deionised water), to give a concentration of 10% the original tissue weight per volume. The sample was briefly vortexed, heated for 15 minutes at 98°C, briefly vortexed again and centrifuged at 16000 g for 5 mins. A 10 μl aliquot of the sample was then electrophoresed in a 12% SDS-PAGE mini gel. A protein standard was also loaded and the gel was run until the dye front reached the bottom of the gel. The use of mini gel systems was not as universally used as they are at present when this work was initiated therefore two systems available in the laboratory were used. The Bio-Rad Mini Protean II system with a 12% Tris/HCl ready gel (using SDS buffers) was used to electrophorese the ME7 samples. A BioRad LW Kaleidoscope prestained protein standard was used to estimate molecular weight. The Invitrogen, NuPAGE® gel system with 12%Tris-Glycine gel and SDS buffers was used to electrophorese the 87V samples with a MultiMark® multi coloured prestained protein standard. The gel was then blotted (BioRad Semi-dry Blotter or Novex blotting system) onto a PVDF membrane (Immobilon – P, Millipore). On unloading, the membrane was placed in methanol for 10 seconds, rinsed in TBS, followed by 0.5% blocking solution (western blocking reagent, Roche) for 5 minutes. The blot was incubated overnight with 6H4 monoclonal antibody (Prionics AG) made up in blocking solution at a concentration of 1:30,000. The primary antibody was drained and the blot rinsed once with TBST (0.1% Tween in TBS), followed by a further rinse in blocking solution. The secondary antibody (Jackson Immunoresearch Laboratories POD conjugated Affinity pure donkey anti-mouse IgG (H+L)) was applied in blocking solution at a 1:30,000 concentration and incubated for 90 minutes. The blots were washed four times with TBST before using the visualization kit. All washes and incubations were carried out using an orbital shaker. Visualization was achieved by using a western blotting kit (Pierce West Dura Western Blotting Kit) according to manufacturers' instructions. The blot was enclosed in a plastic covering, and placed in a cassette with photographic film at exposures of 30 seconds, 1 and 2 minutes. Photographic film was used in preference to a densitometer at this stage to maximise sensitivity and thereby visualise as much PrPSc as possible. Examples of the immunoblots for both ME7 and 87V can be seen in Figure 4. Immunocytochemistry was carried out as described in Brown et al . Briefly brains were fixed in 10% formol saline and embedded in paraffin wax. Coronal sections (6 μm) were pretreated using hydrated autoclaving for 15 minutes at 121°C and immersed in 98% formic acid for 10 minutes. PrP was immunolabelled by incubation overnight with 6H4 (Prionics) as primary antibody at a 1:1000 dilution. A biotinylated rabbit anti-mouse (Jackson ImmunoResearch Laboratories) secondary antibody was applied and the slide incubated for 1 hour. The ABC Elite kit (Vector Laboratories) was used throughout and visualization was achieved using 3,3' diaminobenzidine (Merck). Despite a small size of sample produced by microdissection, the weights of brain areas were reproducible over a large number of samples (see Table 1). In contrast with the weights of samples taken by dissection, such as cerebellum, brain stem and thalamus the samples taken with biopsy needle i.e. 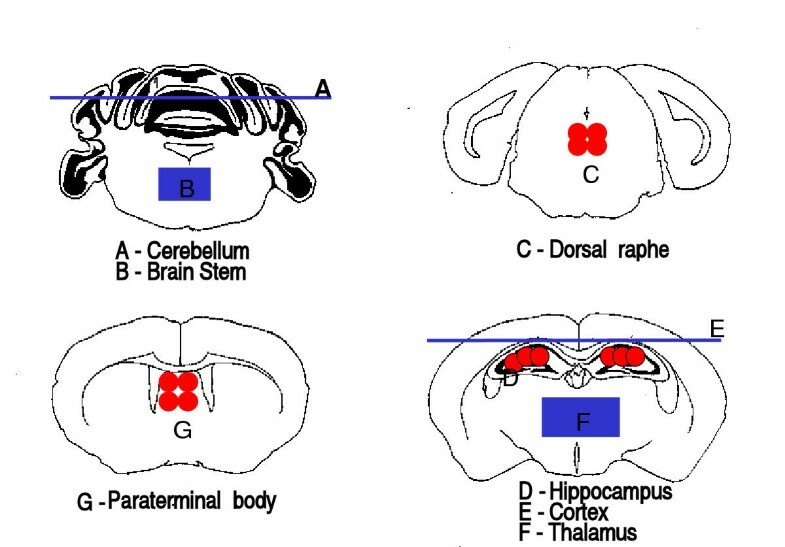 hippocampus, dorsal raphe and paraterminal body show little variation in weight indicating that this is a particularly precise way of sampling the brain area of interest. The protein content (see standard deviations in Table 2) was very consistent in the samples indicating that the method is useful for further comparative protein analysis. PrPSc was detected in all samples as demonstrated in the immunoblots shown in Figure 4. In the samples without proteinase K digestion a series of bands can be seen at a molecular mass between 20–35 kDa representing the total PrP content, i.e. a mixture of PrPc and PrPSc before and after proteolytic cleavage. In Tables 3 &4 a scoring system denotes the presence of PrPSc. A (+) sign signifies where PrPSc was visible in the immunoblots of at least two out of the three microdissected brains. A (?) denotes where PrPSc was visible in one blot but not in the other two. Deposition of PrPSc in microdissected areas of 87V scrapie model. Comparison of dissected brain areas (A-G as in Fig. 2) throughout time course of disease (dpi) in 87V scrapie model. PrPSc deposition (+) visualised by immunocytochemistry (I) and western blotting(W) using 6H4Mab, (?) denotes where PrPSc was visualised in one brain only(see section 2.4), section not available (N/A). Comparison of dissected brain areas (A-G as in Fig. 2) throughout time course of disease (dpi) in ME7 scrapie model. PrPSc deposition (+) visualized by immunocytochemistry (I) and western blotting (W)using 6H4Mab, (?) denotes where PrPSc was visualized in one brain only(see section 2.4), (N/A) section not available. The distribution of PrPSc throughout areas of the brain in the 87V model (Table 3) is strikingly different to that of the ME7 model (Table 4). 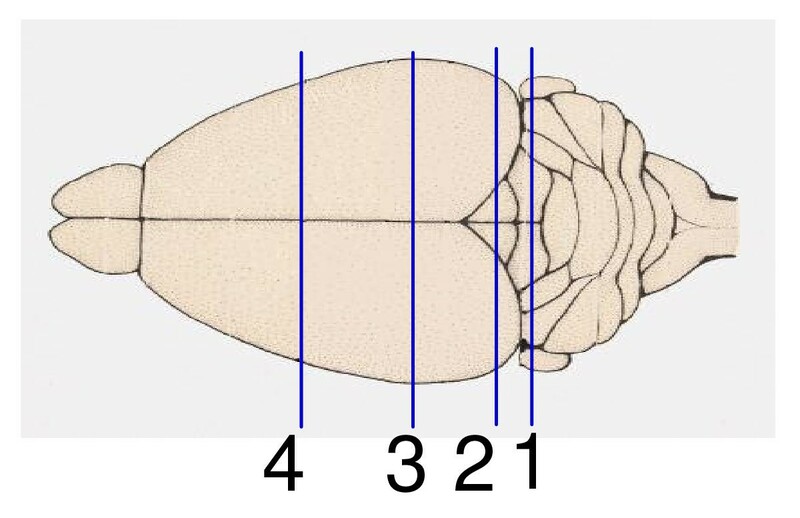 In the 87V model only the brain stem and dorsal raphe are positive at 50% of the incubation period (150 dpi) By comparison every area except the cerebellum was positive at the same percentage incubation period of the ME7 model (90 dpi). The first clinical signs in the 87V model are around 93% of the incubation period (272 dpi), by which time all the brain areas, in contrast with the previous time point (240 dpi) show PrPSc deposition. Western blotting has failed to show PrPSc in the cerebellum and definitively in the cortex of this model, perhaps due to sparse plaque distribution in these areas suggesting a low concentration. PrPSc deposition in ME7 model begins very early in the incubation period (60 dpi) appearing within the hippocampus cortex, thalamus and paraterminal body. Again the immunoblot is only positive in the hippocampus at this time point. In contrast with the 87V model, all areas have PrPSc deposition at 75% of incubation (120 dpi). The first clinical signs in this model are around 92% of incubation (151 dpi) which is a similar percentage to the 87V model. The microdissection technique described above provides a method for obtaining samples from targeted areas to be examined biochemically. The sensitivity of the immunoblotting technique has been optimised to allow for smaller weights of sample to be tested for PrPSc. Combining the two methods provides a tool with which to examine progression of disease within defined areas, thereby supplementing information gained through histopathological techniques. To maximise sensitivity we used photographic film for detecting PrPSc however to estimate glycosylation ratios in each brain area densitometry could be carried out. Our immunocytochemical findings agree with a previous study by Bruce et al  in which these models were also compared using a different antibody and a more limited serial kill. It is interesting to note that although the 87V model has more targeted PrPSc deposition and the amount present overall is less than the ME7 model, both have similar time points where clinical signs are apparent. As has been observed in other models , the concentration of PrPSc within the brain as a whole does not dictate the fate of the animal. PrPSc may be in a particular neurotoxic form to which critical areas of the brain succumb leading to the eventual death of the animal. By isolating particular brain areas with methods such as the microdissection described we may examine other events leading to neurodegeneration in the TSEs which may elucidate the role of PrP. The microdissection protocol provides a standardized approach to obtaining samples from brain areas for analysis. The method described allows us to isolate particular brain areas to examine the events leading to neurodegeneration in the TSE group of diseases. We have already used this method to isolate areas for analysis by magnetic resonance spectroscopy (manuscript in preparation) and for a proteomics study (in progress). In this paper we have demonstrated that PrPSc distribution throughout the brain displayed by immunocytochemistry techniques, can be definitively verified by western blotting the microdissected areas. Using the microdissection of discrete brain areas in combination with other analytical methods will provide a qualitative and quantitative approach in assessing the pathogenesis of TSE infection. The microdissection method could also prove useful in other areas of research where the isolation of discrete murine brain areas would aid scientific understanding of brain function and disease. Thanks to D. Brown and W-G Liu for providing immunocytochemistry results. Thanks also to I. McConnell, L. Gray and E. Murdoch for care of animals and to S. Coupar for help in sample handling. This project was funded by MRC Grant No G9631598. J.B. designed the project and protocols involved, performed microdissection of brain samples, immunoblots, protein estimation and drafted this manuscript. J.F. conceived the initial microdissection study and participated in the editing and drafting of this manuscript. R.S. gave advice on immunoblotting PrPSc, and interpretation of results as well as statistical analysis of protein results. Y-L.C as a joint grant holder of the main project provided advice and consultation on sample application for downstream analysis by magnetic resonance spectroscopy.